Is a Portable Band Sawmill Right for Your Business? There are many different portable band sawmills on the market to choose from. They are possibly the most common type of portable sawmill. A band sawmill is made up of a saw head with 2 band wheels. They have a flexible steel band blade that tracks around the band wheels. It has a frame with a track that guides the saw head through the log. The operator or sawyer pushes the saw head into the log to cut. A Band Sawmill can produce anywhere from 100 board feet per hour for the smaller manual hobby mills to 600+ board feet per hour for the fully loaded hydraulic models. If you are a weekend warrior and only want to saw a few logs at a time, a small 10 horsepower manual mill might be the best choice for you. If you are looking for a higher production machine, one of the automated hydraulic mills will be the right choice. The best place to start would be to determine your production needs and purchase a mill that can keep pace with your needs. The thin band saw blade on these mills will allow for less waste going to the sawdust pile and more boards in your stack of lumber. This translates to more profit for your bottom line. Another benefit of this blade is that you can get a very smooth cut on the surface of your lumber. Many band sawmill owners make lumber to build their own homes. The lumber off a band mill is almost as smooth as the lumber you can buy at a lumber yard. Yet another benefit is that the blades for these mills are very inexpensive. Most blades are around $25 each. This gives you the ability to take a chance and cut logs that may contain metal. The worst you will do is destroy a cheap blade, most of the time the blade can be resharpened for less than $10. The downside of all this is that the thin blade is also very flexible and prone to diving. Anyone who has run a band sawmill for any period of time has experienced this annoying tendency in band sawmills. You get halfway through a cut and hit a tough knot or maybe a little dirt making the blade dull and your blade begins to move around. The end result is wavy boards or even worse a broken or stuck blade. This is where a band sawmill shines. Depending on the make and model you choose you can get a band sawmill that will cut a 40-inch diameter log or bigger. 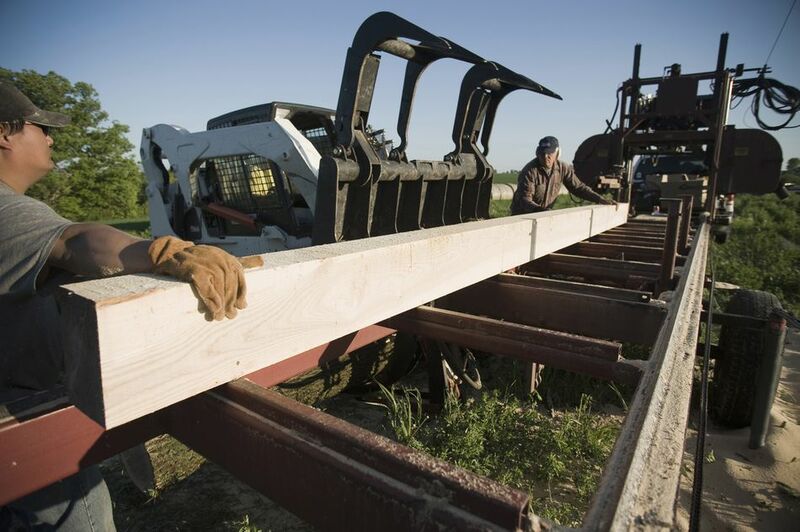 Making wide boards is something that these mills excel at. Small mills will cut a 20-inch wide board and some of the bigger mills will cut up to a 36” wide board. Portable band sawmill prices range widely, manufacturers have models available for every budget. The small manual mills start at around $3,000 and go up to around $10,000 depending on the size of the mill. Mid-size sawmills range in price from $6,000 all the way to $20,000. It all depends on what make and model you are purchasing. Finally, the large fully automated hydraulic mills can break the bank at a whopping $40,000 or more. Don't let the prices scare you, though. A portable band sawmill will retain its value very well if you maintain it properly. You can expect to get anywhere from 70% to 90% of its original value when you sell your used mill. In some cases, used mills have gone for the same price or more than they were new. Just how portable is a portable band sawmill? Well, quite simply it will go just about anywhere a vehicle towing a trailer can go. So if your woodlot is accessible by road or two track then you probably can get your sawmill to the log. Just make sure you have enough logs at the woodlot to justify the time invested in moving your mill to the job site.